Technically, the Terry Bison Ranch is in Wyoming. But once you make a German girl's life-long dream come true and get on a horse to ride around the American prairie, you quickly end up in Colorado, where most of the ranch's grassland is located. So I consider this to be a video about horseback riding in Colorado. On Erik's last day in Colorado before returning to Hamburg, Erik, Scott and I headed up to the border to Wyoming and visited the Terry Bison Ranch, which is a fully functioning (and the nation's 3rd largest) bison farm and a Western resort (cabins and RV park) that features a small zoo (regular farm animals and the more exotic kind, like yaks and ostriches), a fishing pond, restaurants and offers what we came for: to ride a horse in the Wild West. We were greeted by picture-perfect cowboys, who actually aren't just actors (as anyone who has spent too much time at Disney would suspect) but actually are fully involved at the farm. Actually, our conversations with Joey Probert, the leader of our little pack (who did turn out to be an actor as well) made the ride especially charming as he told us about having been part of the farm since he was a small child (leading tours since he was 14) and shared anecdotes about the changes around the farm, re-training horses after their winter break and the bison calf, which had been born 90 minutes before out in the field (we saw the mom lick the calf while riding by). Our horses, Daisy, Gypsy and Spirit, were calm and patient and only rarely tried to sneak in a bushel of grass. The ride was both relaxing and exciting. 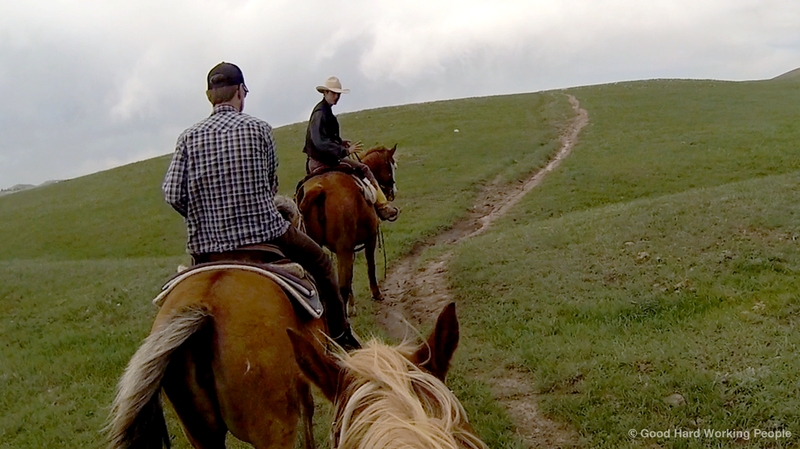 Next time, I definitely want to take the longer ride across the ridge and explore the wilder hinterlands, where you can see elk and antelopes roaming. Or maybe the next ride will be out of Estes Park, where you get to explore mountain trails. The music in this video is the instrumental version of the song "Water In The Creek" by Josh Woodward. This song is licensed under a Creative Commons Attribution 3.0 US License. This video is dedicated to Rhonda S, a British YouTube friend, who makes great horseback riding videos and has been watching my videos for years.